Keeping a portable Mac turned on while the lid remains closed is commonly referred to as clamshell mode. Clamshell mode basically docks the MacBook Air / Pro / etc and allows the GPU to power an external display only, which can help performance of some games and graphics intensive tasks. Additionally, some MacBook users just prefer clamshell mode because it can offer a more minimalist desk experience when using their Mac laptop connected to an external screen. 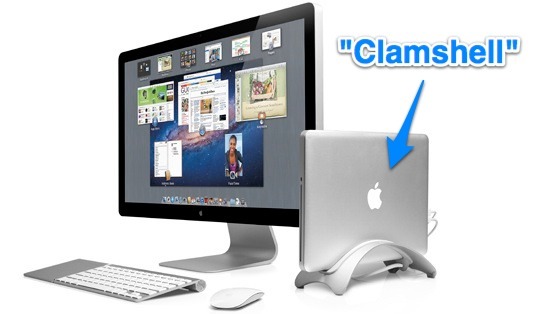 There are several ways to use and enter into clamshell but what we will discuss here is probably the fastest approach for those who use an external keyboard or mouse with a MacBook that is also connected to an external screen. This should work to quickly enter into clamshell mode on any MacBook, MacBook Pro, or MacBook Air, with virtually all versions of MacOS and Mac OS X, and without any issues. Be aware that running a MacBook with the lid closed reduces the ability for the Mac to dissipate heat through the rear fan ports and the keyboard which could theoretically lead to overheating, making clamshell best used in well ventilated areas or with a Mac that’s placed in something like a TwelveSouth BookArc , which is what’s holding the MacBook in the image above. If you open the lid at this point the displays will flicker blue and both screens will turn on, that can be prevented if you’d rather keep the internal display turned off, or you can go with it and set the primary display to tell the Mac which screen to use for the menu bar, Dock, and where windows will default to open to. Thanks for the tip idea Jared If you have any added tips, tricks, or helpful info for using clamshell mode on a Mac laptop, share in the comments below! Isn’t this meant to be bad for the laptop as the fan blows out on the inside ??? Not necessarily though it could be, it really depends on the ventilation and how the Mac is situated. A lot of people report increased speeds using clamshell with games and Photoshop, the Book Arc product page cites a few reviews that demonstrate noticeable Photoshop performance. It’s probably best to use it in a cool or air conditioned environment so you don’t overheat the MacBook in question though. Not sure what happened with my lion, but i can’t activate clamshell mode that easy as before. If I connect my ext. display when the mbp’s lid is closed and click/press a key, it activates the ext. display as extended, not as a single display [internal screen still detected by OSX and “in use”]. So I need to open the lid, find the restart button on the mbp’s screen and close the lid. Then the ext. display goes gray and now the internal screen is disabled. MBPs don’t dissipate any significant amount of heat through the keyboard. No matter how often that misconception is posted, it’s still a misconception. Absolutely correct. There is no threat to overheating with the machine’s lid closed as long as there ventilation around the unit. Clamshell mode only works on my MBP when connected with the power adapter. And, when I read the instructions for clamshell mode on the Apple site (http://support.apple.com/kb/HT3131), it requires the adapter to be connected. Is it just me, or did this article NOT mention anything about the power adapter requirement? You are correct. I wish there was a terminal command where the macbook doesn’t need to be connected to power when in clamshell mode. I was going crazy for hours trying figure out what I was doing wrong. The power connector is the key! You’d think Apple would put that in their instructions for clamshell mode! I use my Macbook Air in clamshell mode all the time (along with the book arc mentioned in this post). One annoying thing about this feature is that you have to have it connected to power at all times. Does anyone know how to do this without having the machine connected to AC power? Didn’t work for me running Mountain Lion on my Mid-2009 MBP, paired with a Mid-2008 24″ Cinema Display. What i did do though, with a little tweaking and elbow grease, and i really mean a little, was to modify an April 2010 post by Paul Horowitz, found above in this post under “set the primary display”. 4) As Paul Horowitz outlined, click and drag the white menu bar to the external display. 5) For me, the resolution on the Cinema Display switched over to its native 1920×1200, but the pointer still resided on the MBP’s built-in display, in some sort of suspended animation, if i do recall correctly. I think the built-in display lost its menu bar to the Cinema Display, but open windows remained at the MBP’s native res. 6) So, to bring everything in-line, i selected “Mirror Displays” and then deselected it again and the coveted result was finally at hand. Is there a way to charge my iphone while my macbook is closed??? Yes if it’s plugged in, it will charge.